Does every cruise ship have a spa onboard? 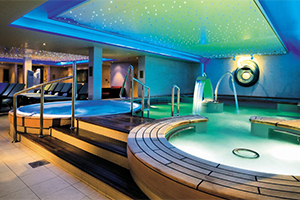 The vast majority of cruise ships have some sort of spa onboard. These can range from 10,000-square-foot sections of the ship with their own sun decks, saunas and pools to a few rooms with massage tables. Spas often have a separate salon section, too. What kind of spa services can I get on a cruise ship? Salons handle beauty treatments such as hair styling, waxing, manicures, pedicures and barber services for men. The spas offer any number of services, from the now-pedestrian hot stone massages and facials to body wraps featuring seaweed, chocolate or whatever else promises detox. On larger ships, you'll also find medispa-style services such as teeth whitening and Botox, as well as acupuncture. How and when can I book a spa treatment? On some cruise lines, you can book your spa treatments on the company's website before you board. For most, though, you'll need to book at the spa desk when you get onboard. If you have a specific time that you're looking for -- getting your hair done for formal night or a massage during a sea day -- get there earlier rather than later; popular times book quickly. If you're in a suite or spa cabin (a class of rooms that come with special spa-like amenities), you might have a concierge or a butler who can make the appointments for you. Are spa services cheaper on the ship than on land? No. In fact, some spa treatments, such as massages, cost more at sea than on land. In general, the pricing is akin to what you'd find at a high-end spa in a big city. Is gratuity included in the cost of my spa treatment? Most lines add an 18 percent tip to the final tab. Your receipt might include a line to add an additional gratuity, but you are not required to tip more. Are there ever spa discounts? 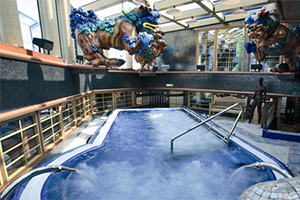 Because most people take shore excursions during port days, the spa offers discounts then to encourage bookings. Also look for packages where the line bundles several spa treatments into one cost. These are usually advertised in the ship's daily newsletter. Is anything free at the spa? The spas usually have a basic sauna that's complimentary; it's often found in the changing room. Sometimes, if you attend a seminar about spa treatments, such a reflexology, you'll be given a free 10-minute treatment. But overall, the spas are there to make the cruise ships money. Many mainstream lines have "thermal suites," relaxation areas where you can swim in a thalassotherapy pool, steam in a full range of saunas, loll on heated loungers or even shock yourself with a snow grotto. On a huge ship, these areas are perfect places to grab some quiet time. You can gain access by purchasing a day or weekly pass; quantities are limited to avoid overcrowding, so book one as soon as you get onboard, as they do sell out. (Sometimes you get a pass for the day when you buy a treatment, but this isn't guaranteed.) If you think you're interested but don't want to commit, ask for a tour on your first day. Some passengers in spa cabins automatically get cruiselong passes included in their fares. I want to go to the spa every day. Can I buy a pass or get a discount? As previously mentioned, you can buy passes for thermal suites by the week or by the day. Most of these areas are walled off from the rest of the spa; you just can't walk into a thermal suite and hang out. You can also get discounts on spa services if you purchase more than one treatment; often these are configured on a sliding scale (10 percent off for two treatments, 25 percent off for three, etc.). What is a spa cabin, and what does it include? Spa cabins or suites are a category of cruise rooms that feature spa-themed amenities, and are usually located close to the spa itself (so you can meander down in your bathrobe). These cabins may include some or all of the following: Asian or Zen-inspired decor, plusher bathrobes, herbal tea, upgraded bathroom toiletries, a fancy showerhead, complimentary fitness classes such as yoga or Pilates and access to the thermal suite. These rooms typically cost more than regular cabins of the same size, but can be a good value for travelers looking for a more spa-themed vacation. Thalassotherapy is defined as the use of seawater as therapy. So a thalassotherapy pool has salt water in it, along with minerals and pulsing water jets. It's supposedly better for your skin, as well as your circulation. None of this is scientifically proven, of course, but we can guarantee you'll feel more relaxed after a lengthy soak! More and more, spas are adding salon and spa treatments specifically for teens and tweens. You might find a facial designed for acne-prone skin, for example, or a Mommy and Me manicure package. Some ships even have separate salons and spas just for kids (Disney is the best example). Keep in mind, however, that spas promote relaxation; thalassotherapy pools and thermal suites typically have an age minimum, and kids should be quiet and respectful when in the spa. Cruise lines usually outsource their spas to licensed third-party providers. Steiner Leisure Limited has contracts with several major lines, as does Canyon Ranch. Will the spa therapist bug me to buy stuff? Often, therapists end your service with a short five-minute pitch to buy a product. One exception: therapists at the Canyon Ranch-branded spas (on Cunard, Celebrity, Oceania and Regent) tend not to pitch beauty products during treatments. If you do get a pitch, simply say "no, thank you" if you don't want to buy anything, or tell the therapist up front that you don't want to discuss products at the end of your spa treatment. How can I learn more about cruise ship spas?